Americans eat 3 BILLION pizzas every year! That means that every single day we eat enough pizza to cover 100 acres of land. In order to do this, we consume it at a rate of 350 slices per second! I have done my part to support this national love affair with pizza, and have admittedly picked up slack for those of you not reaching the average 46 slices per person per year. Read on for our ideas on where you can find some of the most unforgettable pizzas in the world. Nothing says pizza like classic Chicago-style deep dish pizza. 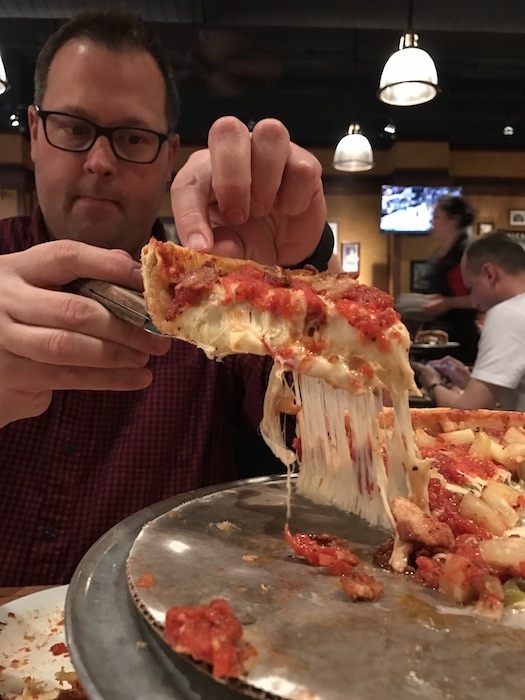 And there is no place to get it quite like Giordano’s in Chicago. The homemade crust, fresh toppings, and gooey, stringy cheese all blend together to form a truly unforgettable (and heavy) pizza. Ann and I shared a small pie on our visit to Chicago, and that was more than enough for the both of us. I mean, just LOOK at that cheese! 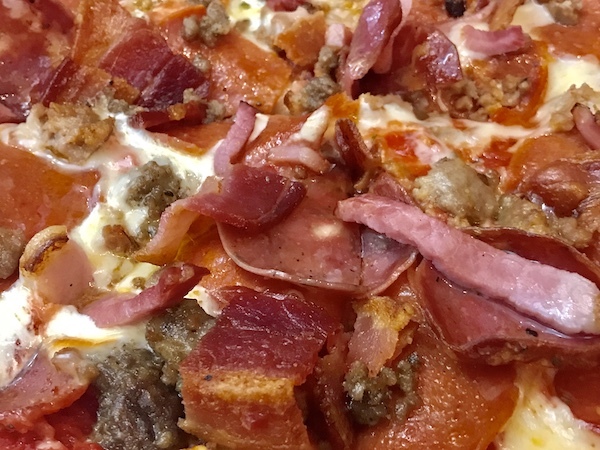 Trust me, this is a life-changing pizza. And good news for Omaha: Giordano’s is currently looking for land in your area! If you go, be careful when you serve up the slices, otherwise you might do what I did. Check out this seven-second video of one of my less graceful moments, and note the laughter from my ever-supportive wife at the end. I think I can honestly say that we’ve never had a bad pizza in Italy. I mean, they invented it. But once you’re there, you begin to notice subtle differences in the pizzas you try. Perhaps the best pizza we had in all of Italy was at a little place near Valdobbiadene where Prosecco wine is made. We only found it because we were with Deb of Italy Unfiltered and her husband, Massi “the driver.” And let’s be honest, one reason you book a guide is that they know where to find great places you’d never find on your own. The pizza we had at that small, family-owned restaurant may have been my favorite pizza ever. The crust, made with artesian grains, was the perfect blend of crispy and chewy. It supported the toppings without being thick. 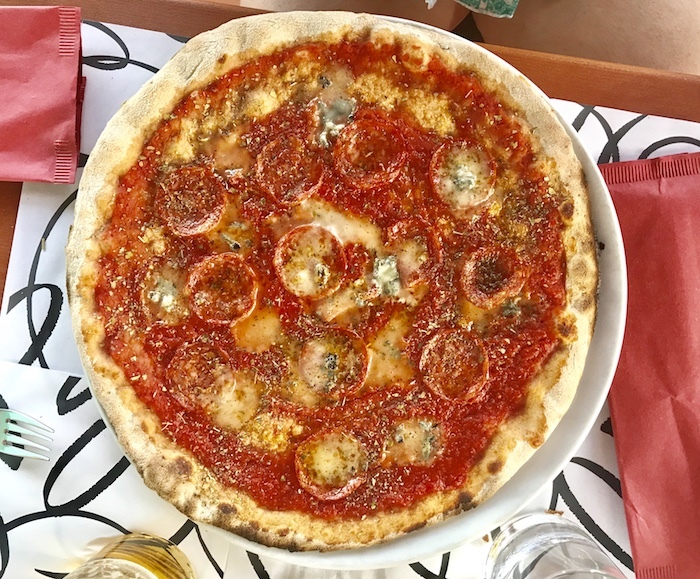 The fresh mozzarella, the beautiful sausage (similar to what we call pepperoni), the light tomato sauce and the spices on top all combined to make this a most memorable pizza. It was still good cold the next day. 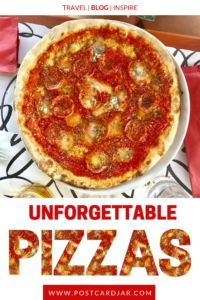 This is more than unforgettable pizza, I still daydream about it. Truth be told is that she didn’t think it would be good because it is breakfast pizza from a midwest-based convenience store chain. But when she bit in to her slice and could taste the way the mozzarella, sausage, egg, and cheese sauce all worked together with the chewy crust, she was hooked. 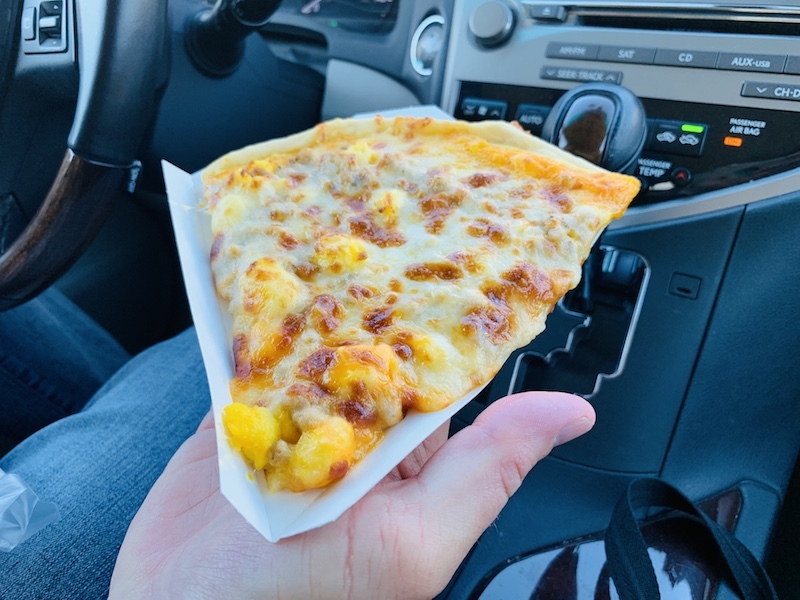 Also available with bacon, this is a perfect $3 breakfast when you’re on the go or, as a whole pizza, when you’re in charge of morning snacks for the office. And let’s be honest, Casey’s regular pizza is pretty darned good, as well! 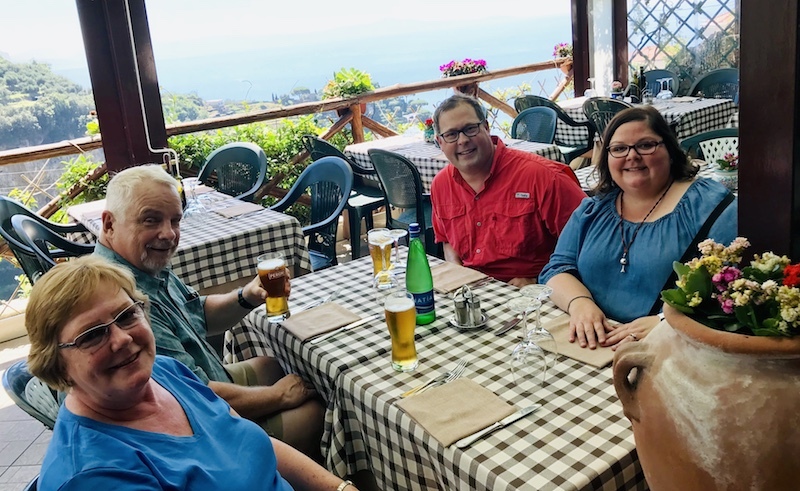 Last summer, we visited the Amalfi Coast in Italy with friends Roger and Jane Speer. We spent a day enjoying breathtaking views and visiting the ruins of Pompeii. 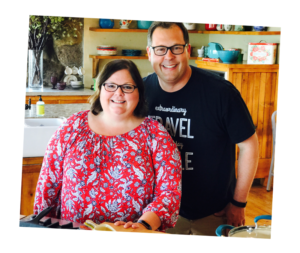 But one of our favorite memories of the day was the incredible lunch we shared in a small town overlooking the blue waters of the coast. Check out that view! We sat down at a little restaurant and savored every bite of food that came our way. The buffalo mozerlla, the caprese salad with fresh olives, and of course, the pizza. Being in the region of Naples, the birthplace of pizza, we knew we had to give it a try. 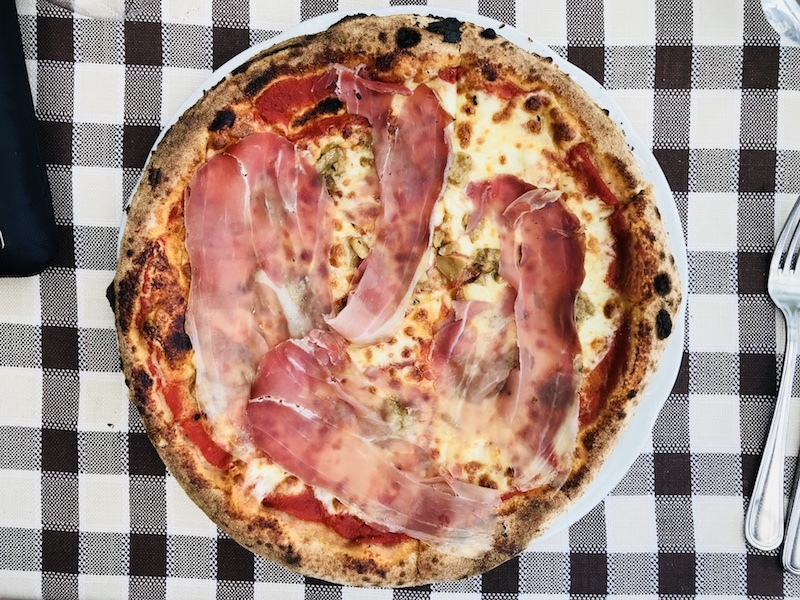 I had a prosciutto pizza, and I have to say it ranked right up there with the pie from Valdobbiadene. Perfect crust, with just the right about of charred spots to give it flavor, fresh cheese, and a light sauce made the base of the pie. The chef then topped it with delicious Italian prosciutto, sliced so thinly that I could see right through it. So good! But when you combined the great food with wonderful company and an incredible view in a restaurant we had to ourselves? Well, it may have made for the most unforgettable pizza experience of my life. But let’s not kid ourselves. When we eat 100 acres of pizza per day, there are lots of unforgettable pizza options out there, and there is no way to include them all on a list. In fact, we had a hard time narrowing this list to only five. So, we thought we’d toss in a few honorable mentions, as well. First (on the left) is the slice of zucchini pizza Ann enjoyed from a hole-in-the-wall restaurant in Siena, Italy. We each purchased a slice and then sat outside on some steps to savor it. Second is the pie at Thunderhead Brewing in Kearney, Nebraska. There you can enjoy a locally-made craft beer along with some homemade pizza. And what better combination is there than beer and pizza? Finally, on the right, is our most ironic pizza, ever. Stuck in Omaha when our flight to Rome was cancelled, we ordered this pizza from Papa John’s because they delivered and we had no car. So instead of delicious Italian food in Rome, we spent the night in a hotel near the airport in Nebraska and had imitation Italian food, instead. Definitely unforgettable. 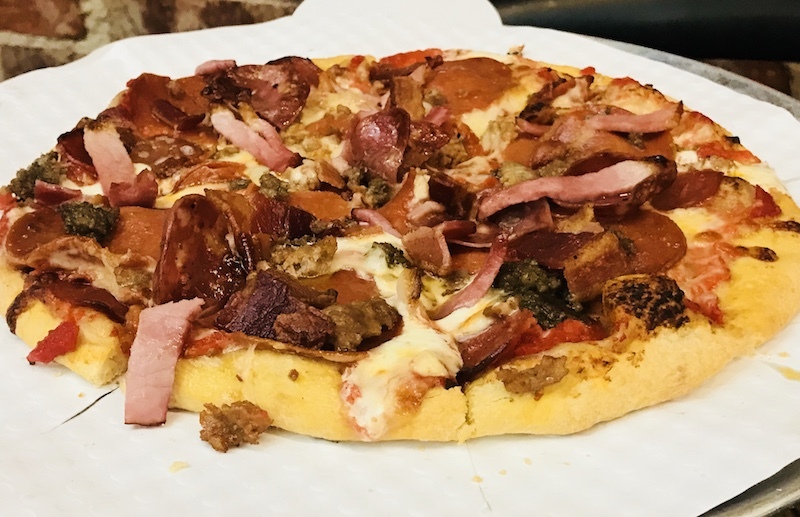 Hope this post gave you some inspiration to find a unforgettable pizza of your own. Happy National Pizza Day, everyone! Note: You can see the source of our pizza factoids HERE.